India is rich in art, crafts, culture, heritage Royal history, tradition, the architecture of course in intricate textiles as well and the history of saree is traced back during Indus Valley Civilisation. Based on varies religions influences a saree is called by names such as sari, shari, chira, or Shadi. and ahead a saree is divided into five important segments namely the main body of the saree or also called as the base of the saree. Secondly border, thirdly the most decorative part of the saree is the pallu or also called as the falling edge of the saree in times called as the head piece. Fourth blouse(unstiched garment) which sometimes comes woven with the saree and lastly tassels or Kuchu. A Saree is nothing to do with religion, caste and creed. The best part of this saree is one size fits all, so you never have to worry about sizing and measurements unlike the dress. But you get 6, 8 and 9 yards sarees. In India, Saree is worn daily as well and especially during auspiciousness occasions like big fat weddings and other rituals like haldi, engagement, temples, festivals, house-warming ceremony and a baby shower as well. 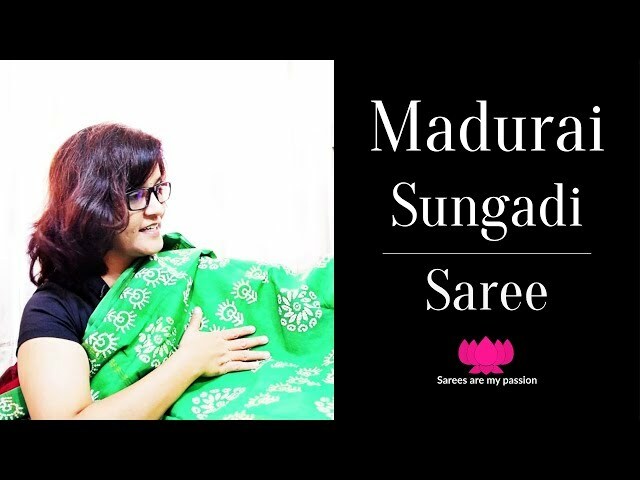 Due to diverse culture and influence, each and every religion in India have their own style of draping this gorgeous Saree in South India Tamil Nadu state we have the popular Madisaru style and Pinkosu, from Karnataka we have something like traditional drape Bootheyara and Coorgi style. From the land of God's own country Kerala the outstanding Tattdukuka style and Namboothiri. The most relaxed Goan style is Kunbi drape. Much prominent drape is Nauvari style from Maharashtra. 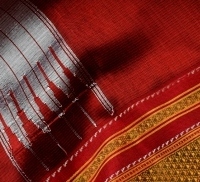 Renowned drape from Andhra Pradesh is Kaccha Kattu, Venukagundaram and Gochi Kattu drape. Saree is not just a product to sell, it is a masterpiece of art which travels across the globe! In India local market I heard shop owners saying that we have Best Quality Saree, Best Price Saree, Wholesale Sarees. I always wonder, the educated crowd are they going to shop around on this? definitely, they say no please. The sophisticated group understand what is a plastic made recycled saree(synthetic versions) and authentic ones! They are always towards the art and crafts part end of the day, they read and update themselves. 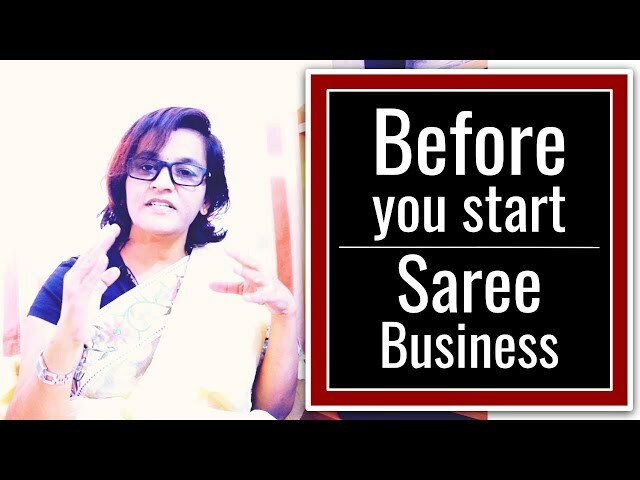 So lets dive into the topic, when you cater fifty year and above Women in Saree Business one should understand them deep, not just getting products(Sarees) and trying to push them. One should understand consumer behavior towards the same. In India, it is unfortunate that each and every lane you can see they do Saree Business, but how many succeed is a question to be answered. 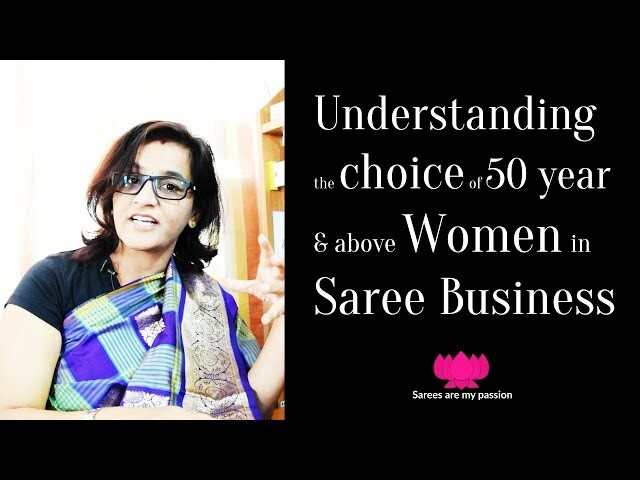 Let us know more about how to cater 50 year and above Women in Saree Business. Venkatagiri sarees or Rajamatha sarees. Venkatagiri is a small town situated in Nellore district, Andhra pradesh state, India. 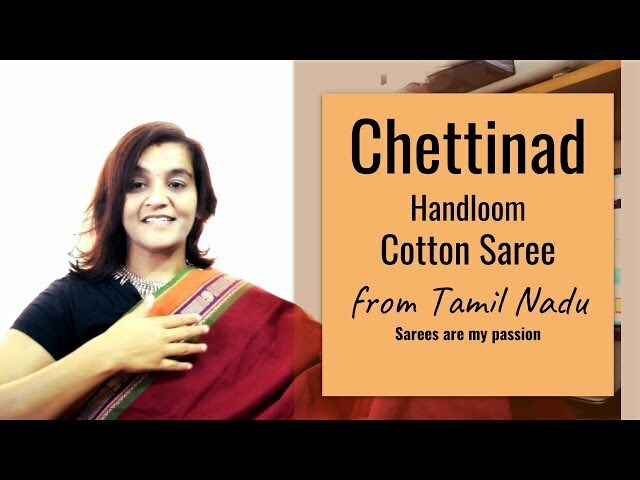 History of venkatagiri sarees dates back to 1700s, during the rule of Venkatagiri, the masterweaver handcrafted these sarees, specially curated for queens, royal ladies and zamindaris. these sarees were purchased for such handsome amounts that the weavers could survive with that sum of money for almost a year until they got their next order. Exclusive designs were made by the weavers on special order for the upper class only. Much of a boost and encouragement given to these sarees, by the Velugoti dynasty of Nellore and also by the Bobbili and Pithapuram dynasties, back then. Indian textiles are rich in artefacts, Begampur is a small town in Hooghly district in West Bengal, the sarees woven here carries deep and bright colours. The economy of this place depends on textiles and also famous for dhotis. What reminds everyone when you say Bengal is handwoven cotton sarees and is the center for fine cotton weaving and these Begampuri cotton sarees are known for loosely woven light-weight and translucent and are extremely comfortable to drape. These cotton beauties would take one to two days to weave which are very simple ones and more intricate designs could even take five to six days to complete, although the saree fabric named after the city, the subtle madness look after wearing them is absolutely sophistigated. The art of blending of old and new? Craving for summer fruits is a must for some like me haha Peaches, the juicy Mangoes, cooling Watermelons what not and what about pairing a perfect outfit the saree for this season is also very important how many of you agree with me? So let's get started, guess what today I would be taking to West Bengal? The guesswork starts ... is it Baluchari, Tant, Begampuri sarees or the brilliantly woven Jamdani, nope it's one of the artistic weave called Khesh sarees. What reminds everyone when I says Bengali is mouth watering and luscious dessert 'Rasgulla' and 'Mishti doi' to name the most popular ones in the list and of course Bengali cotton sarees. The medium of communication here is Bengali. The traditional attire of Bengali women is simple forms of these Tant sarees takes around two days to weave and more intricate designs could even take five to six days to complete a saree. Generally Tant saree comes in pastel shades with beautiful thick borders. The history Tant, particularly the Jamdani and muslin became famous during Mughal era, but the British wanted to destroy the cream of art, to safeguard the textile industry they followed the direction which was given by Royal hands. The partition of Bengal province of British India and departure of British from India many skilled weavers, masterweavers they had to settle themself in beautiful places Nadia, Burdwan, Hoogly of West Bengal the incentive, aid provided by the Government, this is how the new seed was grown and become famous. Contemporary Ilkal sarees goes on a delightful weaves! The most down to earth yet vibrant colors are seen in traditional attire of Ilkal, Ilkal is a small town, this town is located in the South-East part of Bagalkote district, Karnataka state, India. This place is very hot during the summers but has a pleasant weather during the winters. The language of communication here is Kannada. Ilkal was an ancient weaving centre and known for renowned handloom sarees. The main source of income comes from the 'Red granite' which is exported all around the world, while Ilkal sarees are secondary source of income for the people residing over there since generations. 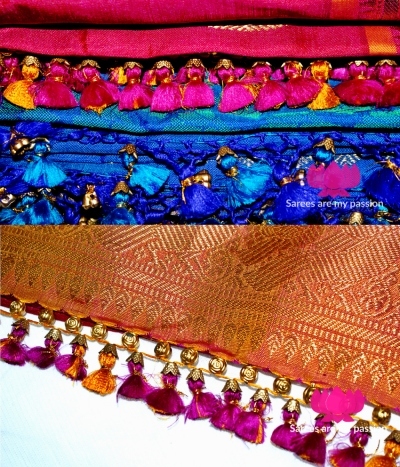 The availability of local raw materials helped in the growth of this saree. Tamil Nadu, the famous Mulberry silk called Kanchipuram Silks apart from this one can see magnificent craft called Toda embroidery, which is locally called as Pukhoor. This beautiful embroidery looks very refined as if it is done in a machine but done by beautiful hands, the hues such as charcoal black and pomegranate red with white canvas, what a blend of shades with impressive thread art, its mind-blowing! 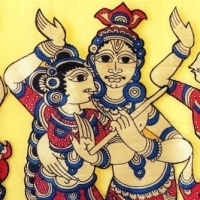 Kalamkari Applique work: A story or a theme is being narrated in the form of patch art called Applique. Applique art dates back centuries ago, Applique work is one of the oldest forms of design in the world and still are used across the globe. Applique is a art decorating one fabric to other which includes Layering, patching, applying. What I noticed is that, they use straight stitch or running stitch, these two are very commonly used stitches practiced while attaching Applique patches on a base fabric. Applique work is used extensively in quilting. You can see in my portrait, yellow cotton saree, this meticulous piece of art called 'Kalamkari Applique work' (machine embroidered applique) I feel like I'm standing in an art gallery, I loved the art involved in it, its makes me fascinating! This exquisite art work can be created in fabrics, plastics, metals, paper etc. Touch of ancient beauty, a small town were colorful artists are born, in Madhubani district in the Indian state of Bihar, Madhubani. 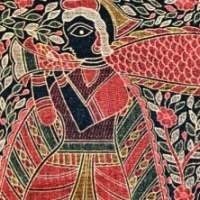 The word "Madhuban" means "forest of honey" from which Madhubani is derived. Madhubani art is also known by the name 'Mithila art', Madhubani painting/Mithila painting was traditionally created by the women of the Brahman, Dusadh and Kayastha communities in Mithila region in India and it is named after Madhubani district of Bihar which is where it originated, this painting as a form of wall art was practiced widely throughout the region. Madhubani painting being accorded the coveted GI(Geographical Indication) status.